In my last blog post we fitted a generalized linear model to count data using a Poisson error structure. We found, however, that there was over-dispersion in the data – the variance was larger than the mean in our dependent variable. Over-dispersion is a problem if the conditional variance (residual variance) is larger than the conditional mean. One way to check for and deal with over-dispersion is to run a quasi-poisson model, which fits an extra dispersion parameter to account for that extra variance. Now let’s fit a quasi-Poisson model to the same data. The outcome of our attempt to account for over-dispersion is that the residual deviance has not changed. The dispersion parameter, which was forced to be 1 in our last model, is allowed to be estimated here. In fact, it is estimated at .79. This parameter tells us how many times larger the variance is than the mean. Since our dispersion was less than one, it turns out the conditional variance is actually smaller than the conditional mean. We have under-dispersion, not over. Anyway – we now plot the regression. We set up a time axis running from 0 to 150 (the number of days). However, we include small increments of 0.1 in order to create a smooth appearance to our plot. We will evaluate the model on these values and then use those values to plot the model. Now we use the predict() function to set up the fitted model values. Finally, we plot the fitted model. We take the exponential of the fitted values because the fitted values are returned on a logarithmic scale. Taking the exponential back-transforms from the log scale to the original data. 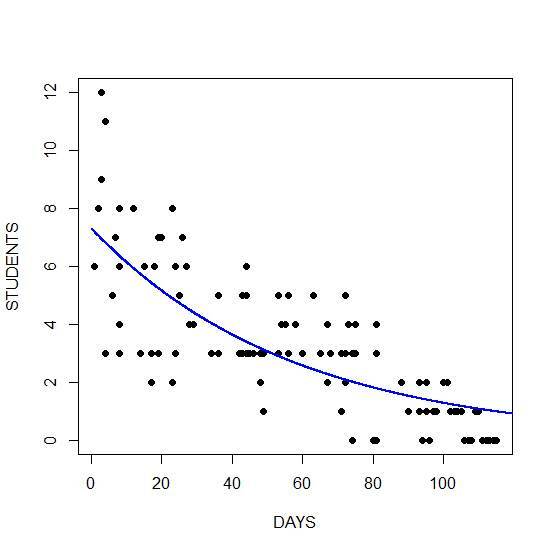 The graph shows a non-linear decrease in cases with number of days. Of course, instead of taking the exponential of the fitted values, we could also have used the predict() function together with the argument type = "response". Let’s calculate the impact on the number of cases arising from a one day increase along the time axis. First we take the exponential of the coefficients. The reduction (rate ratio) is approximately 0.02 cases for each additional day. Hi Am also playing with the possion and quasi poisson in glm. I have found that the parameter fitting is identical using both families. It is only the dispersion parameter that changes. That’s what quasi poisson is. It fits an extra parameter that allows the variance > mean. Poisson doesn’t. thus saying here that you used a quasipoisson is a mistake. Hi Fabio, it wouldn’t be a mistake to say you ran a quasipoisson model, but you’re right, it is a mistake to say you ran a model with a quasipoisson distribution. The difference is subtle. As David points out the quasi poisson model runs a poisson model but adds a parameter to account for the overdispersion. Thanks for this great post. When I use a quasi-poisson model to get the dispersion parameter for 8 different outcomes, I get values ranging from 1.24 – 2. What is a good “cutoff” for overdipsersion? Are all of these overdispersed since they are >1? Just trying to get a better sense of how to make this decision. Thanks! Thanks for writing this helpful tutorial. I’m trying to recreate and am wondering where the “Number” variable come from in your first plot? Thanks!